Sorry... the 2017 Toyota Highlander is no longer being sold as new. Instead, take the first step to a great deal on 2019 Toyota Highlander with a free price quote! 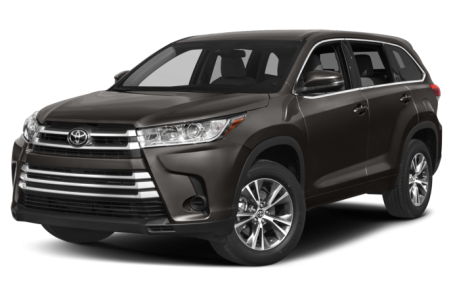 The 2017 Toyota Highlander is a mid-size SUV that seats up to 8 passengers across 3 rows. It competes with the Ford Explorer, Mazda CX-9, and Dodge Durango. This year, it gains a new powertrain option, available sport-tuned suspension, and a minor facelift as part of its mid-cycle refresh. Five trims are available: the LE, LE Plus, XLE, SE, and Limited. Overall, the Highlander still bears a similar resemblance to last year’s model. It retains the same blacked B- and C-pillars, black-clad underbody, and rear-end styling. However, the front-end is where the changes occur. The lower fascia has been enlarged and given vertical motifs. It aligns with the front grille that omits the old chrome bar for better uniformity. Standard features include power/heated side mirrors with turn-signal indicators, a rear spoiler with a high center-mounted stop light, and 18-inch alloy wheels. The SE trim has a more aggressive appearance with its blacked-out grille and fascia. The XLE trim and higher trim levels come with a flip-up rear window and adjustable power liftgate – making it much more convenient for loading and unloading cargo. Other available features include LED daytime running lamps, front fog lights, a power moonroof, and larger 19-inch alloy wheels. Under the hood, the Highlander has two V-6 options – a standard 185-hp, 2.7-liter V-6 engine mated to a 7-speed automatic transmission and a new 295-hp, 3.5-liter direct injection V-6 paired to a continuously variable automatic (CVT) that produces 268 pounds-feet of torque. Front-wheel drive (FWD) comes standard, while all-wheel drive (AWD) is available. Fuel economy for the 2.7-liter models is an EPA-estimated 29/30 mpg city/highway. It lowers to a 19/25 mpg rating for the 3.5-liter models. The Towing Package comes standard with a heavy-duty radiator, 200-watt fan coupling, supplemental transmission oil cooler and a 150-amp alternator. The addition of this package allows V-6 models to tow up to 5,000 pounds. Inside, the Highlander has a standard fabric interior with 60/40 split-folding second-row and third-row seats. The center stack features a standard Entune infotainment system that includes a touchscreen, Bluetooth connectivity for phone and audio, and 3 USB ports in the front. It can be upgraded with an integrated navigation system, an app suite, and a premium audio system. Standard features include air conditioning, cruise control, remote keyless entry, and power windows/locks. Leather-trimmed seating, a leather-wrapped steering wheel, push-button start, tri-zone automatic climate control, and Driver Easy Speak are also available. Driver Easy Speak is a welcomed option that allows parents to easily communicate with their children in the backseats. It uses a built-in microphone connected to the speaker system to project voices from the front seat to the whole car. The Highlander earned a full 5-star overall crash test safety rating from the NHTSA. Toyota Safety Sense P comes standard for all Highlander models. It includes numerous active safety features including a pre-collision system with pedestrian detection, lane departure warning with steering assist, and adaptive cruise control. A backup camera also comes standard. 180 of 189 (95%) consumers said they would recommend this vehicle to a friend.